Prisoners have various needs that have to be satisfied to avoid them from getting angry. 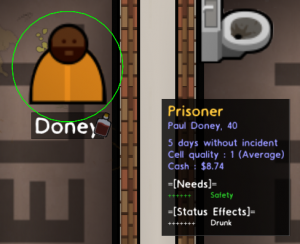 Prisoners (and since Update 11 optionally also staff) have various psychological needs, which they attempt to satisfy by 'completing' the respective activity linked to that need. Prisoners with unmet needs will complain and tend to start fights, staff with unmet needs will work less or even go on strike. A serious complaint balloon. If left unsatisfied, this Prisoner might begin Rioting. The Needs Report shows how many prisoners do have certain needs at all, how many are satisfied currently or not, and how many are actively relieving which needs right now. The overall population feeling on needs can be seen in the Reports, selecting Needs. 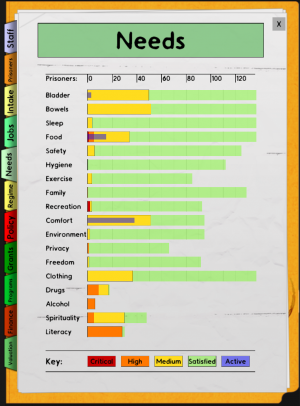 Each need is listed with a bar chart, the longer they are, the more prisoners are affected by the need. Critical Red This need is not being met, or prisoners are unable to satisfy the need. Disruption from prisoners will be imminent if left unresolved. High Orange This need has been unmet for a substantial amount of time and is likely to begin upsetting the prison population. Ensure your prison contains adequate facilities to meet this need. Medium Yellow This need has gone unmet for a short period of time which is acceptable in the normal operation of the prison. Disruptions and riots from this population are unlikely. Satisfied Green Prisoner's needs have been fully met. Active Blue Prisoner is engaged in an activity to meet their need and thus reduce the demand of the need slightly. Prisoners and staff will also display their needs on a tool-tip once a Psychologist has been hired. If a Psychologist is not hired you will be unsure as to what your Prisoners need and in order to prevent 'violent outbursts', you will need to hire one. Inmates will list all of their needs with a number of +s before it, the more +s, the more in need they are. Needs that are currently being met will be displayed in Green. Needs that are not being met in a timely manner will see the need change to capital letters. Prisoners will also visually express unmet needs with picture balloons to indicate they are vocally complaining their desire for a specific need in the form of an 'outburst' they will have a white speech bubble voicing their concerns. If needs are not met for a long time, prisoners may become violent and even begin rioting. However, not all needs will push prisoners to physical violence (e.g. Clothing and Comfort). Prisoners will try to 'complete' their various needs even if there is no items/rooms designated for them to do so, for example a prisoner with a strong need to empty his/her bladder will start urinating on the ground if no toilet is available, or if a prisoner is forced to stay somewhere, e.g. shower or yard, same goes for bowels. Needs can be met by providing the prisoners and staff with suitable equipment for that need. Bladder The Prisoner needs to relieve themselves. Prisoner will seek out a toilet in either the room they are currently occupying due to Regime, or back in their own cell, dormitory or holding cell. Prisoner will urinate on the floor, causing a mess. Bowels Currently this need is identical to Bladder and both needs are satisfied at once. Prisoner will seek out a toilet in either the room they are currently occupying due to Regime, or back in their own cell, dormitory or holding cell. Prisoner will soil their jumpsuit. Sleep The Prisoner is tired. The Prisoner will seek out a Bed or Bunk Bed in either a Holding Cell, a Dormitory or their personal Cell during Freetime or Sleep time in Regime. No specific action. Food The Prisoner is Hungry. A functioning Kitchen with at least one Chef is needed to prepare food to be delivered to the Canteen. During Eat time in Regime, Prisoners will go to the Canteen and seek out a Serving Table in order to get a meal. Prisoner will begin to starve. If the starvation timer depletes entirely, the Prisoner will die. Hygiene The Prisoner wants to get a Shower. Prisoners will seek out a functioning Shower Room and stand under a Shower Head with the water running for a few seconds. This can be achieved during Freetime or Shower in Regime. Prisoners will also shower if there is an available functional shower head in their current room. No specific action. Clothing The Prisoner wants Clean Clothes. Just before a shower, Prisoners will discard their dirty uniforms and pick up a clean uniform from their bed if it is available. A functioning Laundry Room is necessary for the continued collection and redistribution of clean uniforms to cells. No specific action. Comfort The Prisoner needs to Relax. The Prisoner will seek out any available Bed, Bunk Bed, Bench, or Chair in the room they are currently occupying. Reading Mail also helps with this need. [verification needed] No specific action. Exercise The Prisoner wants to stay in shape. Prisoners need a functioning Yard to run laps in, or to use a Weights Bench. This may be achieved during Yard time or Freetime in Regime. No specific action. Safety The Prisoner wants protection, or weapons. When the Danger level increases, prisoners will seek out a way to steal a Contraband weapon. Get more Guards, and keep the danger level low. The Prisoner will flee from an immediate threat. Freedom The Prisoner would like to leave their cell more often. Prisoners will seek out a way to steal a Contraband tool and may begin digging an Escape Tunnel during Sleep time in Regime. Allow for more freetime in the Regime, or leave some doors unlocked. Also the Arcade Cabinet helps to relief the need. No specific action. Family The Prisoner misses their family. Prisoners will seek out a functioning Phone Booth in an existing room. Periodically, a Prisoner's family members may come to visit by arriving at the front door and waiting in a Visitation Room. Prisoners will then attempt to meet with their family members. Reading Mail also helps with this need. [verification needed] No specific action. Recreation The Prisoner wants to have some fun. Prisoners will seek out a Pool Table, TV or Radio in the room they currently occupy, or any existing room during Freetime in Regime. The Common Room is intended to house these and other objects. Reading Mail also helps with this need. [verification needed] No specific action. Environment The Prisoner doesn't like dirty floors. Dirty floors will cause this need to go up. Hire more Janitors or build a Cleaning Cupboard and deploy more prisoners to clean during Work time in Regime. No specific action. Privacy The Prisoner wants to be alone. Being around large numbers of Prisoners will cause this need to go up. Provide functioning personal Cells and limit long stays in Holding Cells or badly equipped Dormitories to keep this need low. Not all prisoners are affected by the need for privacy, you can identify these prisoners as the ones that don't complain when left in the holding cell, these prisoners can therefore be left in the holding cell without becoming tempered. The privacy need can only be discharged by spending time alone in their own cell. No specific action. Literacy The Prisoner would like to read. Prisoners who have the "Clever" attribute will sometimes desire reading material from the Library as a replacement for recreation. If available a Prisoner will go to the Library and take a book with them to read at a later point. No specific action. Spirituality The Prisoner would like to attend a religious service. Some prisoners will want to attend a religious service if one has been scheduled. Services apply the "Calmed" attribute to the prisoner, which has a pacifying effect. No specific action. Drugs The Prisoner wants to do drugs. Some Prisoners have a drug addiction which will cause them to complain and attempt to smuggle illicit drugs back to their cells. This need can be temporarily satisfied through Pharmacological Treatment of Drug Addiction but will return if treatment ceases. Prisoner will begin experiencing withdrawal symptoms such as vomiting. If withdrawal is allowed to complete, the Prisoner will have a diminished desire for drugs. Alcohol The Prisoner would like a drink. Some Prisoners have an alcohol addiction which will cause them to complain and attempt to smuggle alcohol back to their cells. This need can be temporarily satisfied through medical treatment or an Alcoholics Group Therapy session in a Common Room. Prisoner will begin experiencing withdrawal symptoms such as vomiting. If withdrawal is allowed to complete, the Prisoner will have a diminished desire for alcohol. Warmth The prisoner is cold. Place radiators (or other heat-producing objects, like Power Stations) in the rooms of your prisons. Avoid that prisoners are outside for too long during the nights and cold days. No specific action. Luxuries Many Prisoners enjoy a bit of luxury from time to time. You can help them meet this need by building a Shop in your prison, and make a bit of money in the process. Prisoners who meet this need will be less likely to cause trouble, but there's no downside for ignoring it; it IS prison, after all. No specific action. [Baby] Sleep The baby needs to sleep. The baby needs to sleep in a Crib. No specific action. [Baby] Play The baby needs to play. The baby needs to play on a Play Mat. No specific action. Some staff (Guards, Armed Guards, Dog Handlers, Snipers, Chefs, Gardeners, Janitors) optionally also have needs. Staff will only attend to their needs during their break times. You can choose how long each break is, and how many breaks per day are taken in Reports -> Policy. Staff will take a break when they feel they need to, providing there are enough guards idling, but they will always finish their current job before starting their break. No more than 10% of your staff will take a break at any time. Staff will stay on their break until their needs are taken care of, but will give up eventually if nothing is available. The Staff Morale is affected by the happiness of the staff (among other things: long term staff deaths, current injuries, salary). Staff will go on strike if morale falls to 0%, and demand a large pay rise to return to work. Not being able to end a strike within 24 hours is a failure condition. Bladder The Staff Member needs to relieve themselves. The Staff Member will seek out a toilet in the Staff Room (or any staff-only sector) when taking a break. Unknown. Bowels Currently this need is identical to Bladder and both needs are satisfied at once. The Staff Member will seek out a toilet in the Staff Room (or any staff-only sector) when taking a break. Unknown. Rest The Staff Member is tired and needs to take a break. The Staff Member will go to the Staff Room to regain energy. Staff Member will walk slow. Food The Staff Member is Hungry. The Staff Member will go to a Staff Canteen or Staff Room. Unknown. Comfort The Staff Member needs to Relax. The Staff Member will seek out a sofa or chair in the Staff Room when taking a break. Unknown. Safety The Staff Member is not feeling safe. The Staff Member is scared to walk around in your prison. Equip your Guards with tazers and stab vests or hire more of them. Unknown. Recreation The Staff Member wants to have some fun. The Staff Member will seek out a TV or Radio in the Staff Room when taking a break. Unknown. Environment The Staff Member doesn't like dirty floors. Dirty floors will cause this need to go up. Hire more Janitors. Unknown. Warmth The Staff Member is cold. Place radiators in the Staff Room to keep our staff warm. Unknown. Some prisoners may arrive with an addiction for drugs like heroin or cocaine or alcohol. Some others may develop such an addiction when taking drugs because of boredom (i.e. needs like recreation or comfort not met), or dissatisfaction. Addicted prisoners will increase their efforts to smuggle the according contraband into the prison, steal it from rooms, or buy it from other prisoners. If left untreated, addictions will grow stronger with each use of a drug, and with stronger drug addictions also the chance to overdose will rise. Overdoses must be treated by a Doctor immediately and are lethal otherwise. Current addictions do have a strong effect on the re-offending chance of a prisoner. This page was last edited on 4 July 2018, at 10:28.